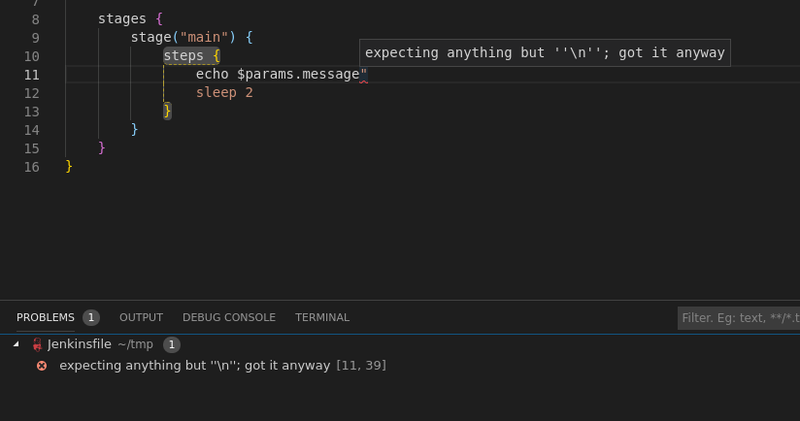 Visual Studio Code>Programming Languages>Jenkins RunnerNew to Visual Studio Code? Get it now. Jenkins Runner can launch any opened file as the Jenkins Pipeline script (declarative or scripted) for a given Jenkins job/project. The extensions needs to know which Jenkins host(s) you are going to launch jobs on - and the Jenkins user(s) you will use to do so. At a minimum, each hostConfig entry requires a url field. This assumes a host with no authentication. Assuming the host requires authentication, the user field is provided. password supplies the user's password. If password is omitted, you will be prompted once per user, per VS Code session, for that user's password. This password is then cached until VS Code is closed, or until the Forget temporary passwords command is invoked. The jobs referenced by jenkins-runner.jobs must already exist on the Jenkins host(s) referenced by those jobs. You or your Jenkins admin must do this step outside this extension. These should be configured as a Pipeline Job. The Jenkins user of the hostConfig(s) referenced by a job must have permission to configure and launch that job. 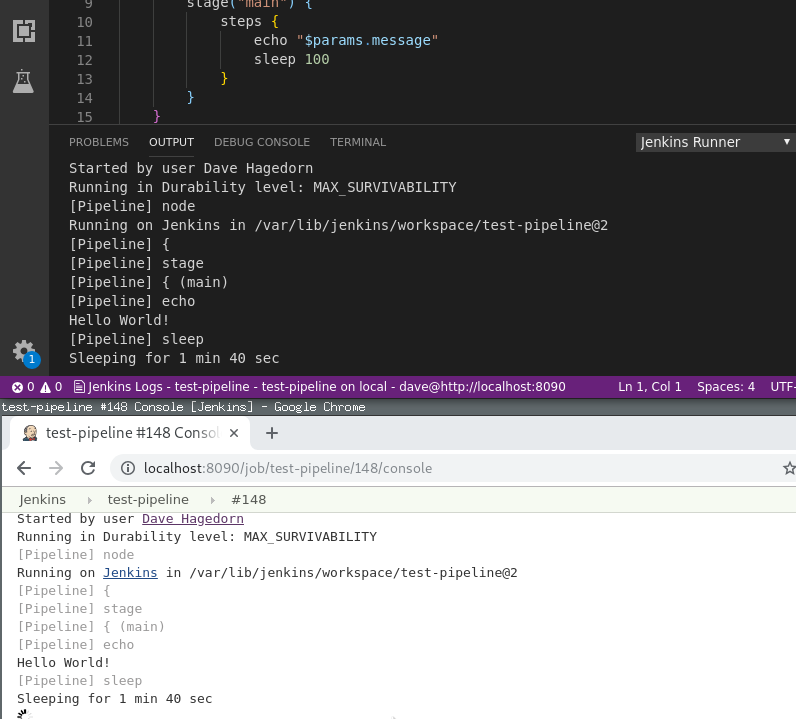 The console output of a running job is shown in VS Code's output console, under Jenkins Runner, and an indicator is shown in the status bar. Clicking this indicator will also show the output console. The command Show Pipeline Log also shows this console. A running job can be stopped using the Stop Pipeline Run command. Any cached passwords can be reset/forgotten using the Forget Temporary Passwords command. Lastly, extension debug logs are written to the Jenkins Runner - Debug Log output console. Each job configuration supports arbitrary build parameters. This is helpful if you want to test a script against different jobs, or run a script against a job on both dev and production Jenkins instances. If your Jenkins instance is secured, you can configure usernames and passwords in user settings. If you don't want to store the password for a Jenkins user, you can leave it blank and will be prompted once per VS Code session, per user.